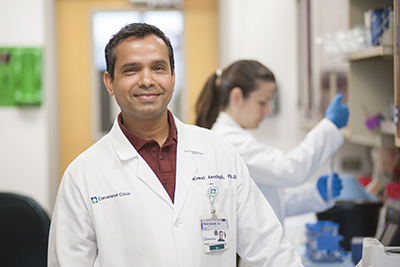 Cleveland Clinic researchers have uncovered for the first time how endothelial cells, which line the blood vessels inside of the lungs, can contribute to the onset of asthma—a common airway disease with symptoms often triggered by exposure to allergens. While most research over the past 50 years has focused on the epithelium that lines the airways or the immune cells that surround the airways, this study shows how the vascular endothelium contribute to the onset of airway inflammation. Previous studies have shown that activation of endothelial cells is one of the first events to occur in events that trigger asthma. Furthermore, asthmatic airways have long been known to contain more blood vessels than healthy airways, and the number of these vessels increases with disease severity. The team of researchers—led by Kewal Asosingh, PhD, SCYM(ASCP), Staff Scientist, Department of Inflammation and Immunity, and first author on the study, and Serpil Erzurum, MD, Chair, Lerner Research Institute—describe for the first time how these seemingly unrelated processes, the activation of endothelial cells and angiogenesis (the process of new blood vessel formation), might work in tandem to drive asthma. In this study, the researchers induced an asthmatic episode in a preclinical model by exposure to house dust mite extract, a common airborne allergen that is a primary trigger of childhood asthma. They found that the house dust mite allergen binds to and activates a receptor molecule called PAR-2 (protease-activated receptor 2). PAR-2 is found on the surface of two types of cells—endothelial cells and undifferentiated blood cells called proangiogenic hematopoietic progenitor cells (PACs). PACs play an essential role in angiogenesis. The "turned on" PAR-2 directs PACs to release VEGF-C (vascular endothelial growth factor C). Upon its release, VEGF-C binds to a protein found on endothelial cells called VEGF3 (vascular endothelial growth factor 3). This protein binding leads to new blood vessel formation and also increases the production and release of pro-inflammatory cytokines. In this way, allergen-driven PAR-2 activation sets into motion a cascade of cellular events that not only contributes to angiogenesis, but also stimulation of the immune system. It is this immune cell activation and proliferation that contributes to the onset and/or severity of symptoms commonly associated with asthma, including coughing, wheezing, shortness of breath and chest tightness—all byproducts of inflamed and obstructed airways. The researchers administered an agent called MAZ51 to a preclinical model of asthma exposed to house dust mite extract. MAZ51 works by inhibiting VEGF-C from binding to and activating VEGF3. This inhibition resulted in reduced blood vessel formation and airway inflammation. "What we have now is both an understanding of what's happening at a cellular and molecular level and, importantly, a completely new pathway to target for the treatment of asthma," said Dr. Erzurum. While additional studies are needed, the team hopes to one day develop a drug that disrupts this disease-driving mechanism, carrying this preclinical research into clinical investigation and trials. Dr. Asosingh is Scientific Director of Flow Cytometry at Cleveland Clinic. Dr. Erzurum holds the Alfred Lerner Memorial Chair in Innovative Biomedical Research, is Staff in the Lerner Research Institute, and a practicing pulmonologist in the Respiratory Institute. The study was published in the Journal of Clinical Investigation and funded in part by grants from the National Heart, Lung, and Blood Institute (NIH). Drs. Asosingh and Erzurum provided the image used on the cover of Volume 128, Issue 7, released in print on July 2, 2018.